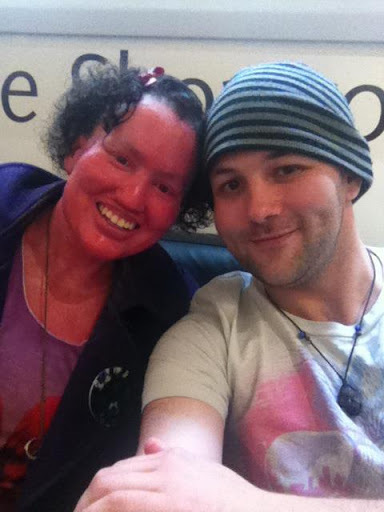 I went to an exhibition opening last week with my friend Mitch. 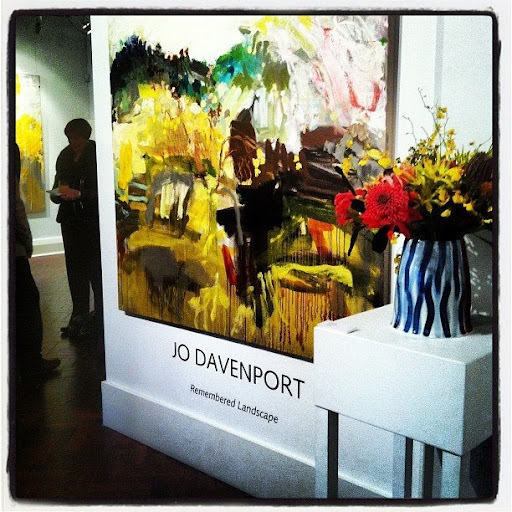 It was at Flinders Lane Gallery for an Albury artist Jo Davenport. There was a older gentleman there who had awesome shoes. My friend left me alone for a few minutes so I went over to talk to the man about his outfit. He said he saw some bright Doc Martens but did not want to pay the hefty price. 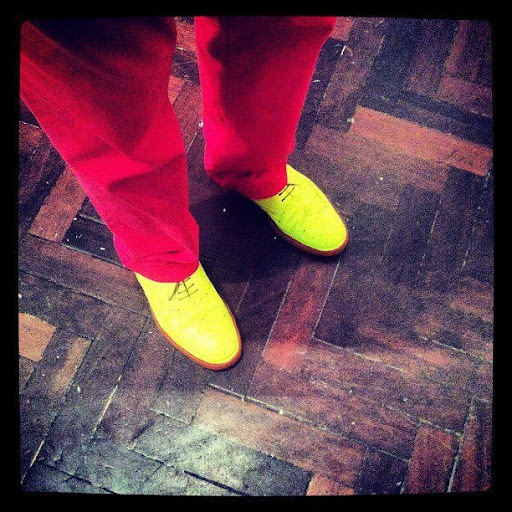 So he painted his old brogues a chartruese colour. Very cool. He said I could take the photo and put it on the internet. 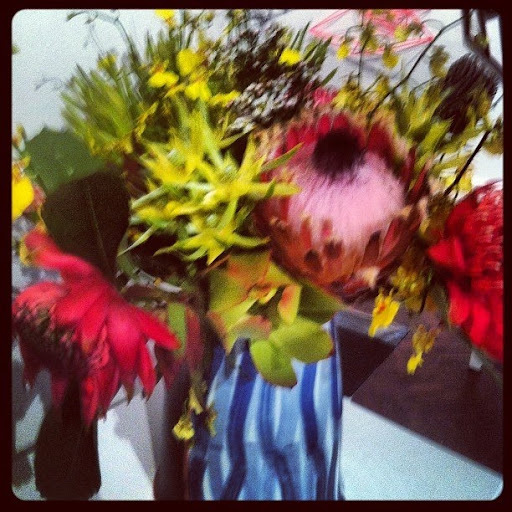 The flowers at Jo's exhibition matched the colours in the paintings. Here is one of the paintings. We loved the colours and the interpretation of the Albury countryside. Mitch and I had plans to pool our money and buy a painting. Big dreams. Here we are. Mitch is awesome - a lot of fun, and he gives good hugs. We later had an argument about blue heaven milkshakes. 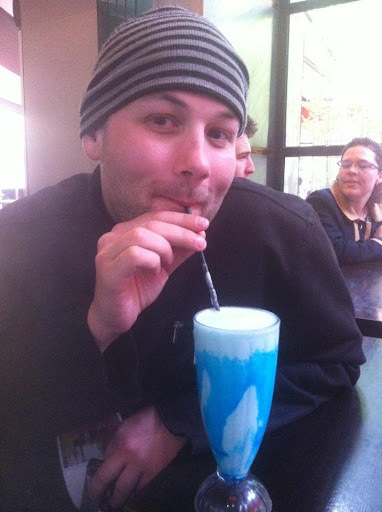 I said he was too old for a blue heaven milkshake. I lost that argument. 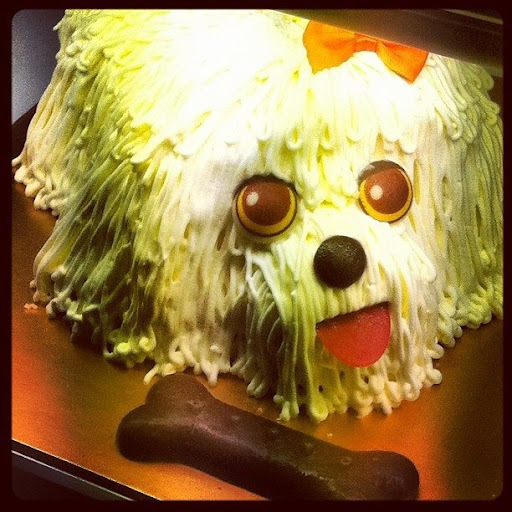 I had to buy a cake for a colleague on Friday. I saw this one on display. How much is that doggy in the window? On Friday night I met some wonderful new friends - Lindy and her daughter Shauni. I have come to know Lindy on Facebook this past year. She and Shauni were down in Melbourne seeing a band. When I was a baby, my family lived next door to her in-laws. Her mother-in-law was known to me as Aunty Dawn and she used to look after me to help my parents out. Sadly, Aunty Dawn passed away in the early 1990s. I think about her a lot - she painted me a plate, and I have it near my stove. Lindy, Shauni and I got along so well, talking as though we've known each other for years. We shopped and ate. It was fun. 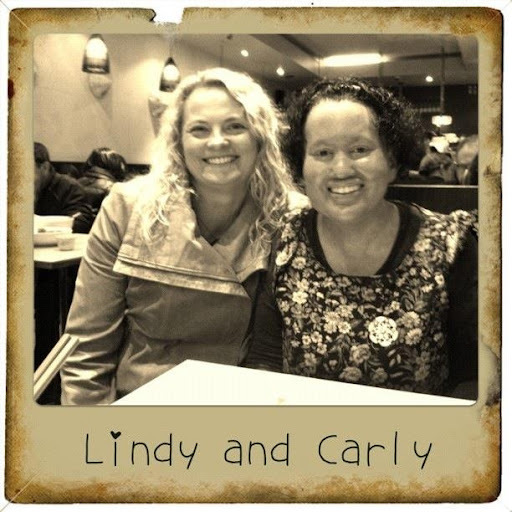 Lindy does amazing work for Mercy International, sponsoring a child in an orphanage in Thailand. 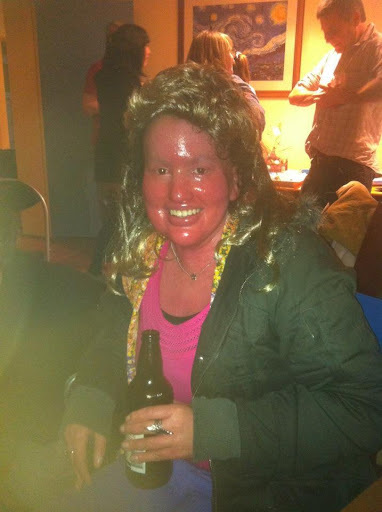 I wrote about her here. 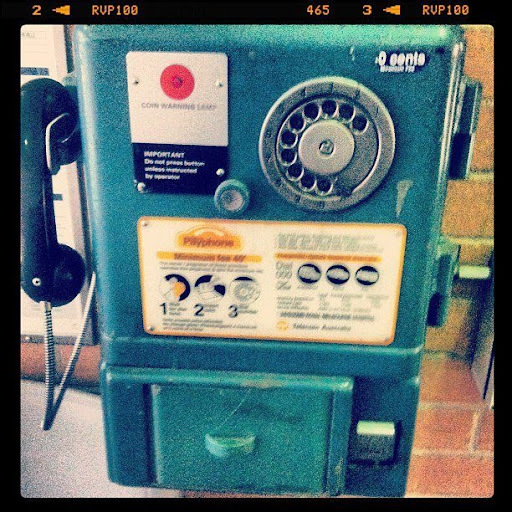 This is a very old phone at the Royal Melbourne Hospital. I love it! I went to a party last night. I stopped in at the very cool Tom Phat for a pre party cocktail and meal. 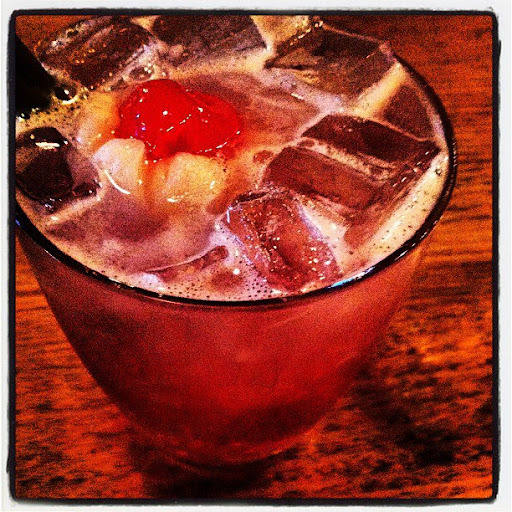 This was lychee, ginger and cherry. Yum! I ate the carmelised pork belly which was accompanied by an Asian coleslaw. It was delicious. I was smack bang in hipsterville. There was nothing but boutique ciders amd beer. I bought a chocolate stout. Very stouty, not too chocolately. Interesting. There were a number of themes at the party. 80s, triliogies or pyjamas. I did not adhere to any theme, but I did put on my friend's mullet for a minute. Classy. 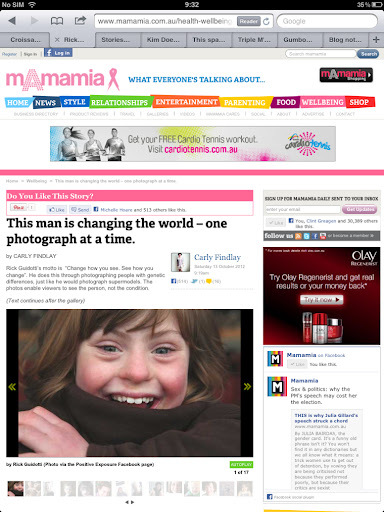 Finally, dont forget to check out my piece on Mamamia - I wrote about the fabulous Rick Guidotti. 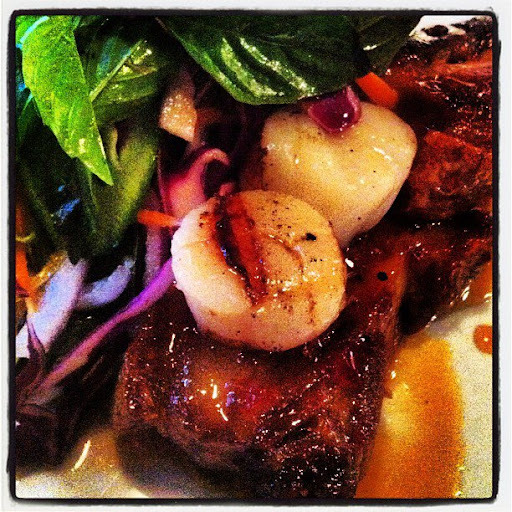 That pork belly and scallops picture is making my tummy rumble. Ha ha, love that Royal Melb 'vintage' phone - didn't realise there was any still about! 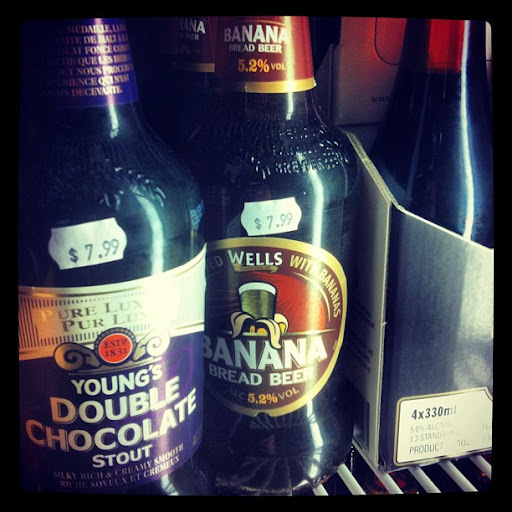 The Chocolate stouts seem to be the latest new thing in beer, it's everywhere! 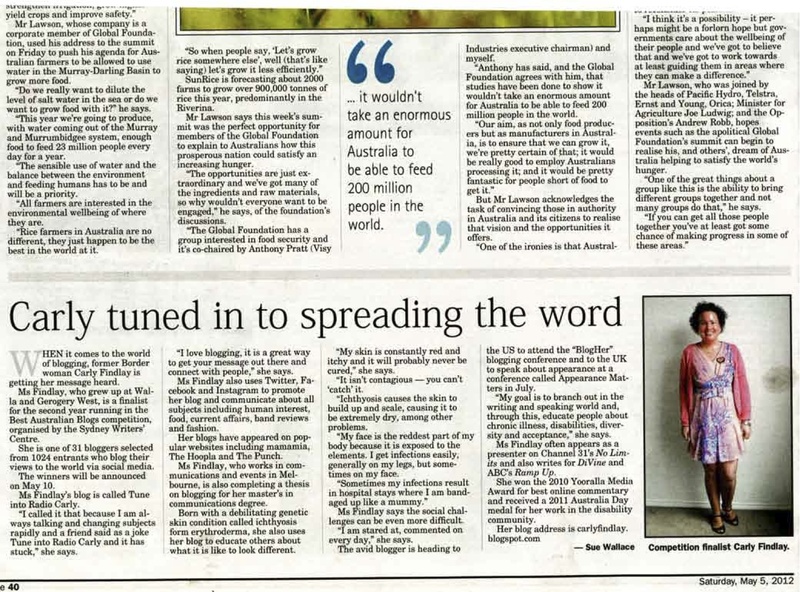 The Jo Devenport art looks amazing! Looks like it was a pretty good week, to me! Thank you for finding the time to meet up with us on Friday - I know how busy you are! We had the best time shopping, chatting (like old friends) and our very first Vietnamese meal! We didn't stop smiling all night. Thanks again Carly - it was great!